Will March Come in Like a Lamb or Lion? This was the second time I created a March lamb or lion bento. The first one was this bento I made last year. As the name of my blog may tell you, I like lambs. This was my first time making tortilla roll-ups. They look a little messy but tasted delicious. 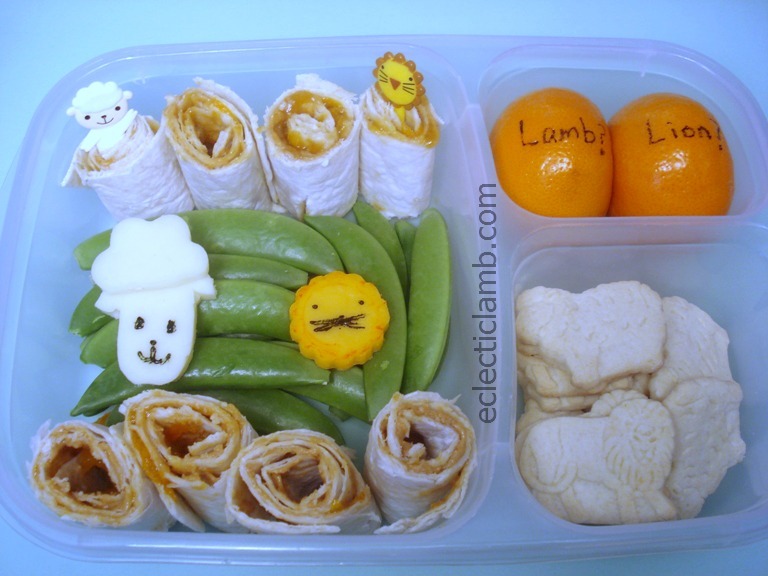 This entry was posted in Bento / Cute Food and tagged bento, lamb, sheep, vegetarian. Bookmark the permalink. 23 Responses to Will March Come in Like a Lamb or Lion? Thank you! Yes, I would be happy if the whole month was like a lamb. this is a very neat one. Cute theme! And lunch looks lovely! Thank you so much! I am always looking for themes that include lambs. So cute, love the lambs! I love the cheese lamb and lion. Great idea! You are so creative!